← New Grammatics songs? Yes please! 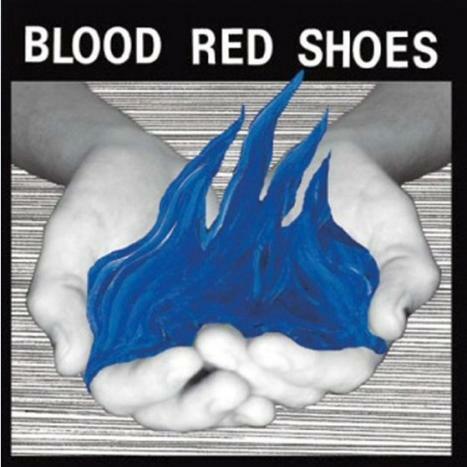 I did very much enjoy Blood Red Shoes’ debut album Box Of Secrets, but I couldn’t help but wonder where they could go from there with their second record. The answer, as it turns out, is the obvious one – with Fire Like This, they’ve continued to follow the trajectory of fierce, grungey boy-girl indie-rock. But while the band aren’t fixing what isn’t broken, this isn’t just Box Of Secrets pt II – the band have subtly experimented and pushed their own boundaries, while maintaining a consistent quality that should make countless new bands green with envy. The biggest departures on the record sit somewhat opposed to each other. On the one hand 7-minute album-closer ‘Colours Fade’ represents a bit of a gamble for the band – known for the punchy nature of their songs, can they make an ‘epic’ work? The answer is a resounding yes – sure, musically it’s a fairly straightforward song, comprised mainly of a steady beat and reverb-laiden guitar, but it’s the kind of song that begs you to lose yourself in it, particularly when the echoy chorus of “ah-ah-ah-aah”s kicks in. As a complete contrast, ‘When We Wake’ is easily the most contemplative and beautiful song the band have ever written. A slow-burning anthem that builds from fragile guitar and quiet drums into the band’s more usual, full-on sound, it really showcases how pretty Laura-Mary’s voice can be. Other new songs stick out as they seem to be so packed with hooks and ideas that they could have comprised multiple songs, but instead the band switch effortlessly between styles to create some fantastically dynamic and varied tracks. ‘Keeping It Close’ starts out with a raw blast of guitar before pulling back on the reins, letting Steven’s vocals come to the forefront before re-building itself via a menacing delivery from Laura-Mary. ‘One More Empty Chair’, on the other hand, begins with a sense of quiet melancholy, building up its energy with an increasingly urgent-sounding bridge – before unleashing it all in the chorus. Yes, ok, a lot of the appeal comes from good old quiet/loud dynamics, epitomised on first single ‘Light It Up’. But why should that be a complaint when it’s done so well? It’s not unreasonable to say that there are tracks like ‘Don’t Ask’ or ‘Heartsink’ certainly wouldn’t sound out of place on the band’s debut, but crucially they don’t sound like re-hashes or cast-offs – they’re simply more of the band at their no-nonsense best. It’s perhaps an easy thing to say about an album I like, but there isn’t really a dud track on here – it would be easiest to pick at ‘Follow The Lines’, but in the context of the album it’s interesting to hear a song that ditches the quiet/loud dynamic for a quiet/quiet one. I’m not sure why, but I found myself connecting more with these songs when I listened to them on record than I did when I saw the band play live recently. Maybe that’s because Blood Red Shoes feel like the kind of band that you have to really invest yourself in to fully appreciate – and knowing the songs helps a lot in that regard. The good news is that if they keep creating records as consistently good as Fire Like This, then your passion for the band will be more than justified. can’t wait to get to listen to the album!! Been anticipating the second album for ages! Still one of my fave bands and would love to see them again! !